Need to pick up a lot of leaves, grass and other lawn debris? The DL12720 is Echo Bear Cat’s largest debris loader, making it easy to move massive amounts of material from the ground to a truck or trailer. This loader is powered by a Subaru EH72-2 OHV V-Twin. It only produces 25 hp from 720cc of displacement, but there’s more to this engine than numbers: By targeting that output with a bigger engine, Subaru was able to design something that makes a lot of torque over a wide RPM range. Almost all of the “peak” rated 37.6 lb-ft. of torque is available from 2,400 to 3,200 RPM. This makes it the perfect engine for the DL12720 belt drive because the motor can run at lower speeds, reducing wear and fuel consumption while spinning the fan fast enough to provide the power you need. This engine also features a two barrel side draft carburetor, valve stem seals, an improved breather system, a dual filter air intake, three piece piston rings and a high compression design head. The lubrication system is fully pressurized and uses a trochoid pump, an oil cooler and a full flow filter like you’d find on a car, and it has a higher oil capacity than anything in its class. What does all this mean? This engine is so well protected from wear that owners can expect horsepower to drop by less than 1% after 300 hours of operation. It’s also CARB and EPA certified, so this loader can be sold throughout the U.S. and Canada. It has a 12-volt electric system has a 15 Amp charging capacity, giving the starter plenty of power to turn the motor over, and it can also power an optional lighting system for better visibility. A 9-gallon gas tank means fewer stops for refueling and even the P.T.O. got the heavy duty treatment, rolling on heavy duty ball bearings. Power from the engine is transferred to the impeller fan via a double-banded drive belt with manual engagement. That means you can turn the fan off and on without stopping and restarting the engine. The fan uses four blades with serrated edges, providing more efficient flow than a flat design. 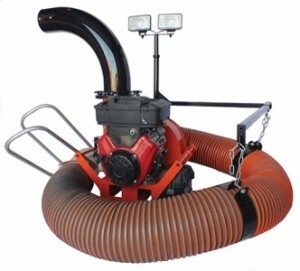 In this model, the 20-inch fan can pull debris through the intake at speeds up to 3,400 CFM and shoot them out of the chute at a rate reaching 5,100 CFM. Debris is picked up by a 12 inch wide, 12-foot long intake hose. It’s mounted to a swinging boom and uses a pair of aluminum handles, which means less weight for the operator to move around. The loader uses a skid mount base so that it can be bolted to a trailer, truck bed or different platform. Want to make it portable? Echo Bear Cat offers a trailer kit built specifically for mounting this loader. Add vertical and horizontal extensions, and the chute can reach into any trailer or truck bed. If you’re looking at this loader, you’re probably needing it for commercial or municipal use. For you, Echo Bear Cat guarantees the DL12720 with a one year warranty. Buying it for a rental business? It’s still protected for 6 months. Using it around your home, which happens to cover several acres? It’s protected for three years. What about the engine? No matter how you use it, Subaru will warranty the motor for 5 years. Shank’s Lawn Equipment is your one stop shop for the DL12720. They’re an Echo Bear Cat Signature Elite dealer, which means they have the parts stock and company training to be among the best shops in the country. They’re also a certified Subaru Industrial Power products dealer, so they can help you with any problems you may have with your loader. Visit their website at www.shankslawn.com and you’ll have access to an experienced staff that has served Pennsylvanians for over three decades. Are you a local? Stop by their shop in Chambersburg at 4900 Molly Pitcher Highway. That’s just off route 11, or take Exit 10/Marion from I-81. This entry was posted in Uncategorized and tagged Debris Loader, DL12720, ECHO Bear Cat, OEM, Shank's Lawn. Bookmark the permalink.